Is it Time to Rethink Your Data Protection Strategy? Are you interested to hear how you get more value from your data and how to better protect your data whilst saving costs? 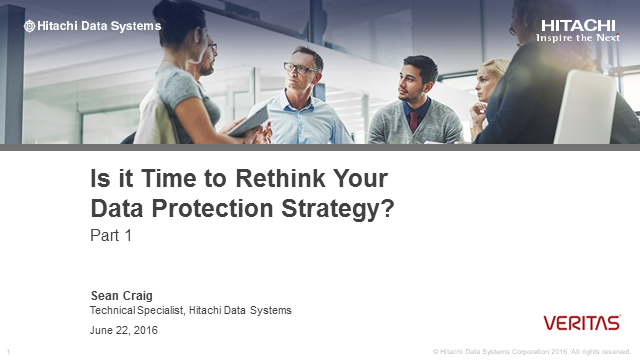 Please join this 20 min webcast to discover how you can optimise your data protection strategy. 2018 was a year of maturity for digital transformation. Most companies committed to digital transformation, laid out a strategy and are planning resources. Public cloud, agile methods and DevOps, RESTful APIs, containers, analytics and machine learning are being adopted. In this session, Hu Yoshida and Pratyush Khare will review the trends that they see for 2019 in APAC and the balanced approach to digital transformation as we learn from experience and resist chasing after the hype. They will discuss how this will affect data, AI, cloud, the data center and corporate responsibility. Join Tony Palmer, senior analyst from Enterprise Strategy Group, and technical experts from Hitachi Vantara and Broadcom as we discuss how customers can achieve strict zero RTO/RPO objectives for mission-critical Oracle database deployments. •Join experts from Enterprise Strategy Group, Hitachi Vantara and Broadcom as we discuss how you can achieve strict zero RTO/RPO SLO’s for your Oracle database deployment. •Learn best practices to maximize Oracle performance on Hitachi Virtual Storage Platform (VSP) and Hitachi Unified Compute Platform (UCP). •Ask your toughest Oracle questions and, if you can stump the experts, win a prize! This webinar including a demo will show you how to use intelligent automation to increase operational efficiency. We’ll see a more balanced approach to digital transformation in 2019 as we learn from experience and resist chasing after the hype. The data center is not going away, and we look to more hybrid approaches that maximize ROI. In this session, Hu Yoshida and Shawn Rosemarin will discuss how this will affect data, AI, cloud, the data center and corporate responsibility. They will express their own thoughts and should not be considered representative of Hitachi. IT infrastructure has never stopped becoming more complex and more critical to business, and the load on both that infrastructure and the personnel that run it has never stopped growing. As a result, automation has become a major competitive area for infrastructure vendors. Managing data is about more than managing capacity growth; organizations today need to adhere to increasingly strict data privacy, compliance and governance regulations. Privacy regulations like GDPR and California’s Consumer Privacy Act place new expectations on organizations that require them to not only protect data but also organize it so it can be found and deleted on request. Traditional backup and archive are ill-equipped to help organization adhere to these new regulations. In this live webinar join Storage Switzerland and Hitachi Vantara for a roundtable discussion on the meaning of these various regulations, the impact of them on traditional storage infrastructures and how to design a storage architecture that can meet today’s regulations as well as tomorrows. Nowadays implementing an intelligent data governance strategy is key. In this webinar you will learn how to easily discover and act upon identifiable information for regulatory compliance. It is no secret that data is every company’s most strategic asset. How you manage, access and secure your data is critical to your business operation. More business leaders see object storage as the right technology solution for data governance. IDC conducted a worldwide survey with enterprise organizations to help gain insight into the drivers for their storage retention needs. Findings from the survey uncovered common trends, initiatives, and pain points from more than 500 companies in Asia Pacific. In this session guest speaker, Rajnish Arora, Vice President, Enterprise Computing at IDC Asia/Pacific and Matthew Hardman, Director of Data Intelligence at Hitachi Vantara APAC share those findings. Copy Data Management promises to not only improve the data protection process, it promises to provide value to the organization even without a looming disaster. It can reduce storage costs by presenting virtual copies of data to test/dev, analytics and reporting. It also can make sure those copies are refreshed so those use cases are always dealing with the latest copy of data. Join Storage Switzerland and Hitachi Vantara for our live panel discussion where we will show how copy data management better protects the organization and makes protection more than an insurance policy by adding value to the organization. We’ll show how Copy Data Management can reduce the cost of storage throughout the data center while at the same time improving processes like test/dev, analytics and reporting. Finally we’ll also explain why copy data management solutions may actually be better at protection since they store data in its native form, enabling it to be recovered more quickly. The webinar will also include a live demo of Hitachi’s Data Instance Director. See Copy Data Management in action! There’s a lot of hype around data-driven business. And as enterprises face the coming wave of Machine Learning and Artificial Intelligence, there’s also a lot of confusion about how to prepare your data, infrastructure and organization for this work. In this webinar, Donald Farmer of TreeHive Strategy, sets out 5 questions you can ask of your business to assess if you are making the most of your current analytics, and if your roadmap for the future will be effective. We’ll consider the tools you use, the skills you need in organization and the data pipeline you need to build for governance and flexibility. Donald’s approach covers both strategy - What do you need to achieve for your business? - and tactics - How will you achieve it? CIOs, IT managers and anyone working in analytics and data management will find it insightful and helpful. Every organization is coping with increasing amount of data and new expectations from customers. Do you feel threatened by the Digital Tsunami? In this video, Naveen Mishra, Gartner’s Research Director, is going to share with you how infrastructure, operations and data centers should respond to the challenges brought by digital disruption. Then KC Phua, Director, Technical Experts, Data Management & Protection from Hitachi Vantara, will talk about the technology behind data center modernization. As artificial intelligence and machine-learning technologies mature, enterprise storage vendors can empower customers on their journey to autonomous operations and harness the full potential of data. Together we can ride on the waves of digital transformation. You’ve heard about the benefits of hybrid cloud and how it allows businesses to take advantage of the best features of public and private clouds to deliver new revenue, better customer experiences, and lower costs. Now learn how including a carefully considered data strategy in your hybrid cloud architecture removes barriers and enables data mobility, ultimately allowing you to generate insights and create better business outcomes. Today, organizations capture and retain more data than ever before, whether to maintain a history of transactional records, an audit trail of an interaction, or even for analysis to uncover more opportunities through technologies like Big Data. However, data also can represent one of the biggest threats a company needs to deal with, without proper management, security and discoverability, organizations may quickly find themselves impacted by government or industry-based data regulations. There are some customers who have managed to take control of this challenge, leveraging a combination of technology and process, they have been able to turn data in to the asset they had always planned it to be. Join Matthew Hardman, Director of Data Intelligence, as he shares how Hitachi is building a data services platform that can address your challenges and opportunities around data governance. •What are the largest cost drivers in my data center? •How can IT accelerate my time to market? •How do I optimize costs like power and cooling? •How can I proactively identify inherent threats and issues? Hitachi Content Platform (HCP) is object storage software designed to intelligently manage data as a key business asset and govern valuable data to reduce compliance risks. It is also the heart of a portfolio of solutions that are uniquely integrated to address today’s challenges and adapt to future needs. The portfolio includes Hitachi Content Platform for object storage; HCP Anywhere for file synchronization and sharing and data protection; HCP Anywhere edge file services as a cloud storage gateway to HCP, and Hitachi Content Intelligence, where rapid insights emerge from data/ Hitachi Content Platform portfolio centralizes data into a single platform to enable you to better understand, govern and control your data. IDC conducted a worldwide survey with enterprise organizations to help gain insight into what the drivers for their storage retention needs are. Findings from the survey uncovered common trends, initiatives, and pain points from 975 users of object storage across three regions – North America, Europe, and Asia Pacific. The rapid increase of sensor devices in the industrial realm has created a wealth of data. These sensors can report on a host of conditions, including temperature, moisture, pressure, the working order of a given component or even raw video images. Each day, new machines, sensors and devices come online, feeding new information into data systems for analytics. The new insights can drive significant operational improvements, but a robust analytic data pipeline that incorporates IoT data is critical to making this possible. • Drivers for IoT adoption and desired business outcomes. • Data challenges created by IoT. • How to build an analytics data pipeline that addresses IoT data challenges. • Analytics data pipeline in action – IoT analytics success stories. While everyone agrees data is the new currency, it can quickly turn to an unforeseen liability if not managed well. Complexity of data silos, intense pressure from digital disruptors, business reliance on reaping digital dividends, and increasingly rigid regulatory environment mandates a well governed data strategy. Today’s data governance frameworks leaves a lot to be desired. Intelligent Data Governance ensures that data management is automated as per appropriate organizational policies, business standards, and global regulations while allowing business to extract in-time insights for agile decision making. Join us to learn how can you tame the increasing amount of data diversity, meet with the emerging data privacy regulations & compliance standards, automate the key governance policies, and modernize data protection. Data is changing the way we work. We are changing the way data works. Title: Is it Time to Rethink Your Data Protection Strategy?